A south Mississauga high school is offering a first-of-its-kind football prep program in the Canadian public school system, starting in September. 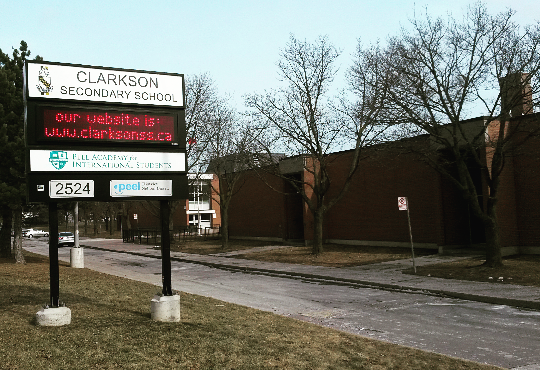 Clarkson Secondary School will be home to Football North Canada’s prep program. “Our goal is to attract top Canadian talent and keep them in Canada, and we found a great partner in the Peel board,” said FNC head coach and director of football operations Larry Jusdanis. “Working together, we want to provide student athletes with the opportunity to specialize in year-round football training and compete against the top high school teams and coaches in North America,” while they earn their diploma. Between 35 and 50 athletes are expected to participate in the program’s first year. “Just as their coaches are committed to helping them achieve athletic excellence, we too are equally committed to helping these student athletes be a part of a school where they will be supported to learn, achieve academically and contribute as valued members of the Clarkson community,” said Peel District School Board superintendent of curriculum and instruction support services Poleen Grewal. Students in the Football North Canada prep program will be coached by its employees, and won’t compete in any Region of Peel Secondary School Athletic Association (ROPSSAA) sanctioned games. Clarkson will continue to field its Chargers football team, which will compete in ROPSSAA. Families and players must contact Football North Canada directly to learn more about their recruitment process, which they run independently. Training camp begins Aug. 15.